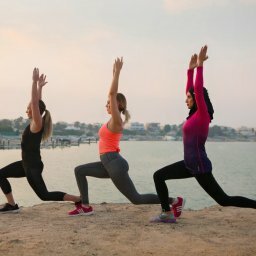 Home Capital Fitness News MY FITNESS JOURNEY BEGINS……..
Hey everyone, I am the front of house manger here at Capital Fitness Abu Dhabi. Having been inspired by the amazing results our members have been achieving thanks to the help and support of our personal trainers, I decided it was time for me to start my own fitness journey. I have a friends wedding in May and another in July and my goal is to lose around 5 kilograms of fat, improve my physique and be more toned for these important events. Like most women I want to look and feel good, there is nothing better than feeling happy and confident in your chosen outfit around people you haven’t seen for a while. The objective of this blog is to share with you my progress, experiences and results in hope to inspire some of you, in the same way that I have been inspired by our clients own fitness journeys. I hope this will be particularly interesting for beginners or people who might be unsure of what to expect from personal training. A good start would be telling you a bit about myself, I am 30 years old and moved to Abu Dhabi approximately a year ago. My weight has always fluctuated between 64kg and 71kg. Since moving to Abu Dhabi my weight has increased and I am now at my heaviest. I absolutely love food, especially the treats and have definitely enjoyed one too many brunches and takeaways over the last 12 months. I have trained at other gyms on and off for several years, often searching Youtube to find exercises that target certain problem areas, like many, I have also participated in large group classes. My workouts would usually consist of 30 minutes of cardio on something like a cross trainer, followed by 20 minutes of sit ups and a few token weight exercises targeting my arms and legs. Classes were great for will power and pushing myself but they always felt so over crowded. I’m sure the instructor would try his or her best to teach a safe class, but with so many attending they didn’t really stand a chance. I could never really tell if my technique or position was correct and unfortunately I injured my lower back. The first step in my journey was to have a consultation, this included an Inbody analysis, this measures skeletal muscle mass, body fat mass, extra cellular water, basal metabolic rate and visceral fat (this is the fat distributed between internal organs). The results showed I had low muscle and high fat. This was particularly evident in my torso around my organs. I was shocked by these results, but Phil reassured me that they are reversible with the right exercise and nutrition plan. Not only did we look at my body composition but Phil also asked about my personal goals, expectations and previous exercise experience. All of this additional lifestyle information enabled him to build the initial exercise program from where it would evolve as my body (and mind) changed. I have been training with Phil the head coach for just over 2 weeks, four times a week with a combination of push, pull and leg workouts. These sessions are all focused on weight lifting. I must admit, I had previously been scared of lifting heavy weights as I thought they would make me big and bulky. However, I can assure you that I have witnessed quite the opposite. In just a short time I have noticed that my shape has improved and I am firming up in all the right places. In the last week I have been barbell squatting, deadlifting and using free weights, working on the whole body over the four sessions. I am really enjoying the programme and I definitely feel the benefits of working with a personal trainer. On some of the sets I don’t think I have another rep in me, but Phil gives me the encouragement I need to give another two or more reps that I wouldn’t do if training on my own. My posture is also not the best, from many years of working at a desk. Phil is always making sure I am in the correct position when doing each exercise and has selected extra movements to help improve my posture. Food tracking was something I was not looking forward to in the beginning but after sitting down with Phil and discussing my current diet I could see where I had been going wrong. I was massively under eating in the week and really overindulging at the weekend. After discussing macros (carbs, protein and fats) I learnt that I was hardly eating any protein which is great for repairing muscles especially after working out. Instead my diet consisted of mainly carbs and fat. Phil has set me a calorie and macro target so I track my food in the MyFitnessPal app, daily recording everything that I eat. The app breaks everything down for me and easily tracks what I have eaten and how much more of each macro is needed to hit my target. The first few days I found difficult to reach my 1800 calories and again struggled to hit my target of protein, but after some tips from Phil and being more organised with my food I am hitting all targets and feeling fuller for longer. At this early stage we are trying to balance my diet and if my weight increases then Phil will reduce my calories but for now it is important for me to track my food properly and be monitored further for the next few days. I have learnt more in the last 2 weeks than I have in years, I had never even heard of macros and now I am tracking them! What shocked me the most was the different sources of proteins, carbs and fats, we all know the obvious but I had no idea about some of the foods that came up when tracking. I am now weighing my food to get an accurate result of how much carbs, protein and fat I am consuming to give myself the very best results. I prepped my lunches for the week to save time and avoid grabbing a tin of soup out the cupboard. All of the above has definitely changed the way I look at food. Phil is educating me everyday in all aspects of fitness and nutrition, changing my mind set and attitude for the better. Having made the first steps to achieve my goal, I am feeling positive, more knowledgeable and more determined then ever. The first week was hard but I’m now coming to the end of week three and I am already seeing the benefits, I feel stronger, sleep better, wake up easier and feel a lot more focused and energised throughout the day. I started like most people not knowing what to believe, having read and seen so many different things on social media, it can be very confusing but finding someone you can trust and taking the first step is the hardest part! I look forward to sharing more of my journey with you all, if I can do this then anyone can, it is never too late to change your lifestyle so set that goal and go for it!